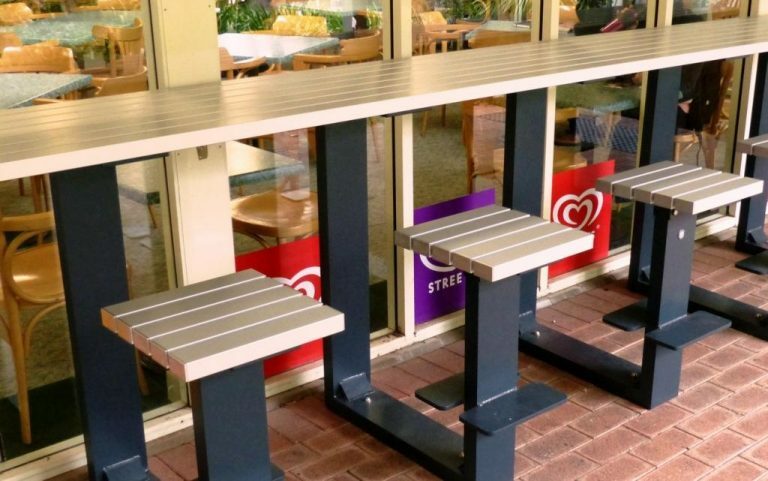 In addition to installing our standard street furniture in a series of projects since 2010, Murdoch University has also utilised our range alteration service. 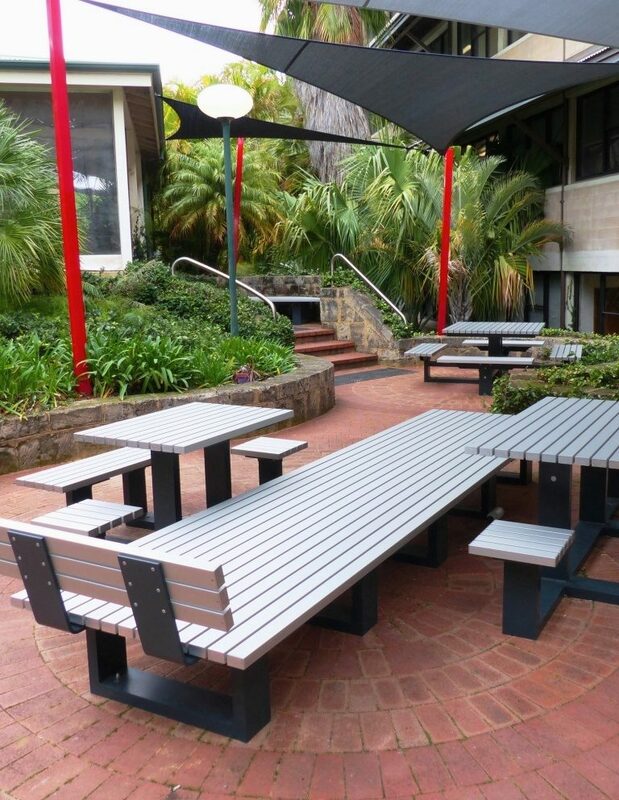 On this occasion we were approached by the Campus and Facilities Management Office to see if we could help rejuvenate neglected and underutilised alfresco areas around the Sir Walter Cafe, located in the central courtyard of the Geoffrey Bolton Library. 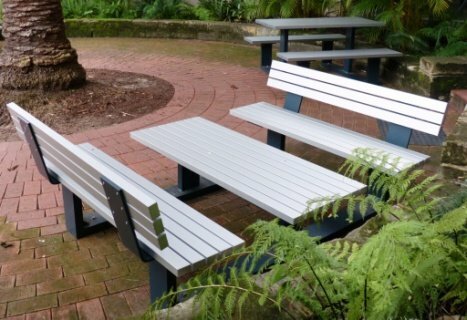 Working with a very tight budget, our brief was to activate the spaces by creating an interesting variety of seating and table arrangements based on our most economical street furniture range, Parkline. The aim was to encourage more students to visit, utilise and enjoy the areas, either on their own or in groups. The client wanted to accommodate the maximum number of people, and also prevent the furniture being rearranged by students, without the need for costly footings. In close liaison with the client project team, we examined the brief, visited the site, and produced several layout and furniture design options for consideration and review. The final design comprised both standard Parkline items and site-specific arrangements including a combined seat/platform/table setting ‘island’, a series of ‘U’ shaped seating with integrated tables, a coffee table setting and a bar-height table with stools. 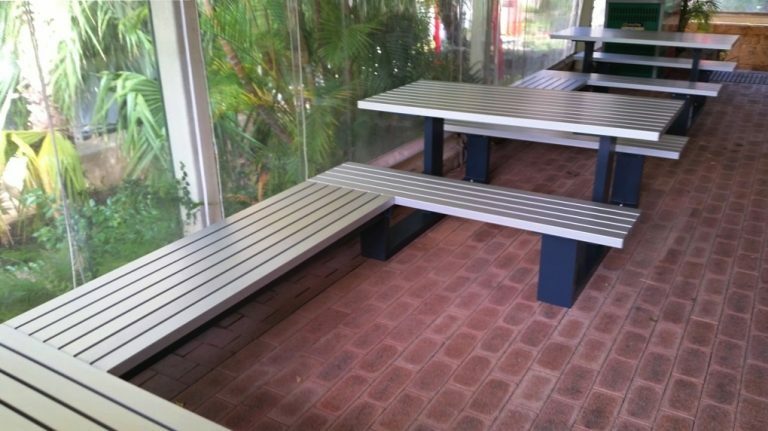 Cost effective installation was achieved by base-connecting the table-and-seat modules, allowing the furniture to be fixed in place by epoxy-fixing stainless steel bolts through the bases and into the existing brick paving. The seat/platform/table combination provides multiple seating options. A bar-height table with stools allows seating in a narrow thoroughfare. Coffee table setting for a casual meeting area. 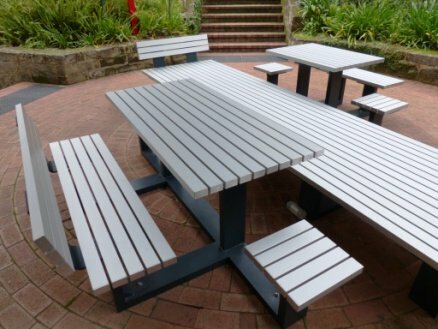 'U' shaped benches with tables once again provide flexibility. The arrangement of furniture in 'islands' to maintain pedestrian access.